Went to a wedding, met a monkeh! Seemed like a nice chap. On the arts front, I have finally finished the print installations that I’ll be taking to the Penarth Pavilion Gallery for a new show that opens next week, with work from Swansea and Cardiff Print Workshops. These small stamped images of Frida Kahlo were developed from a screenprint I did last summer. I did a series on nine women artists who inspire me and I made the rubber stamp of Frida as an experiment and I really like the result so I’m hoping to do the rest of the artists in the series. I printed these on Shiohara paper and stitched them to a heavyweight Tate Gallery Indian paper and sewed ribbon onto them so I can tie them to the wooden clothes horse. These cyanotypes from drawings I made of elderly women are printed onto pieces of Bockingford paper cut to a Victorian corset pattern and I’ve used eyelets and ribbon to tie them to the wooden clothes horse. I’ve been working on these for ages and it’s been lovely to get away today for a family wedding, my wonderful nephew and his beautiful wife. Top wedding and great food at the Oxwich Bay hotel on the Gower Peninsula. Spectacular scenery despite the torrential rain. So this is my tiniest model ever; my new great-nephew aged eighteen days. He’s adorable. Nevertheless he’s a real pain to draw. 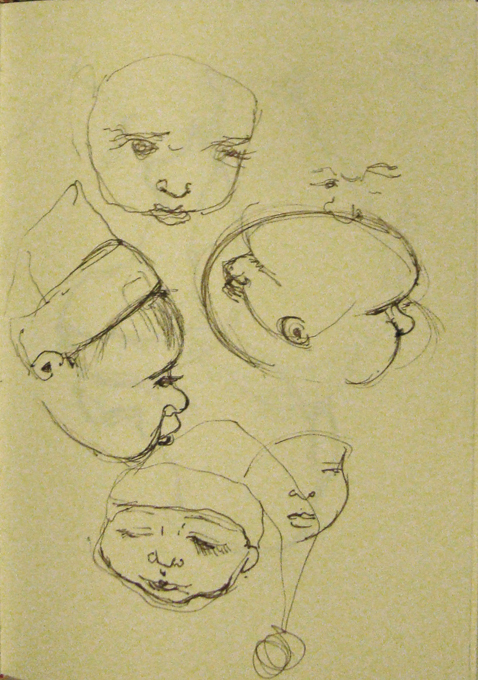 Babies and children have such weird heads, all scrunched-up tiny faces set in the bottom bit of an enormous skull. And they’re either bald or have male-pattern baldness [even the girls] or have hair like upended mops. Terrible to draw! 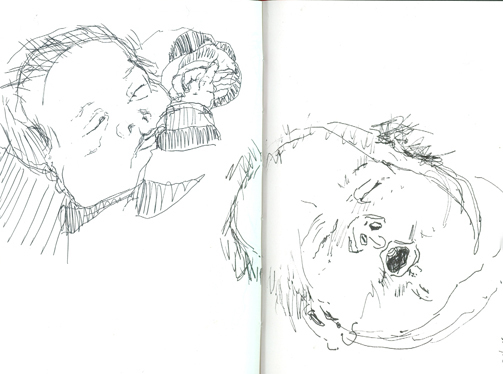 Anyway, the little darling was sleeping in the crook of my arm while I balanced my tiny sketchbook on top of him and drew with the other hand using a Faber Castell Pitt size S. I love his little squidged-up hands bent over and around each other, with dimples instead of knuckles. And funny little skinny nostrils. He’s actually much prettier than this. I haven’t done him justice. See how hopelessly in love I am? 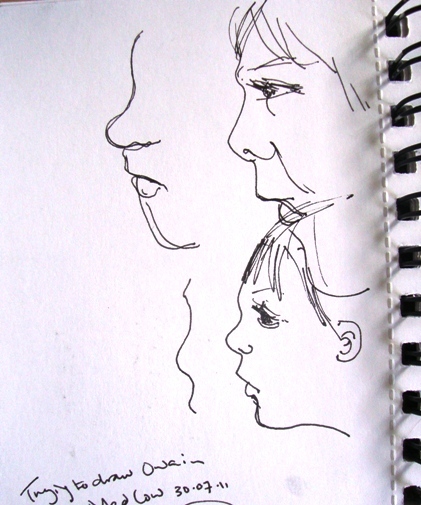 We do some regular sprog-sitting [sorry I’ve been informed she’s a teenager this year, not a sprog] and it’s a chance to try and get to grips with the weird proportions of a child’s head. Their facial features are all scrunched into a much smaller area than an adult and their heads therefore look much larger, with a higher forehead and bigger skull. Like aliens. Their bigger heads then throw out the proportions of the rest of their body. I find them incredibly difficult to draw, but I need to practice. I’ve been informed that children have bigger heads because they have bigger brains and at least they’re not pinheads like adults. You might have guessed that there’s a young alien looking over my shoulder as I’m writing this. It’s just been in the kitchen making mince pies with Uncle. It makes very good pastry. For an alien…….. I babysat three young relatives today and I’m absolutely shattered. How do parents cope? Kudos, parents. I took them to see Keith Bayliss’ exhibition, The Enclosed Garden, at Mission Gallery. After I threatened them and they stopped running round and being loud, we all settled into the lovely contemplative ambience of the exhibition and absorbed the beauty of the sculptures. I settled the littlies down with their sketchbooks and some pens and they sat on the floor for the best part of an hour, drawing quietly. 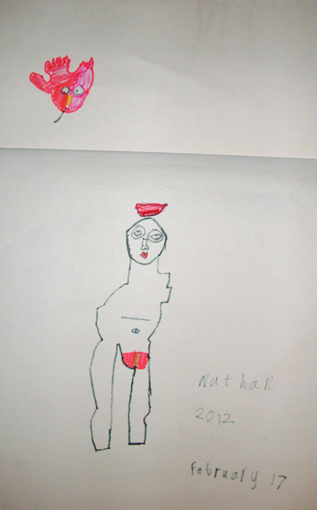 The drawing above is by Owain aged 7 and the one below by his sister, Rhiannon, who is 5. 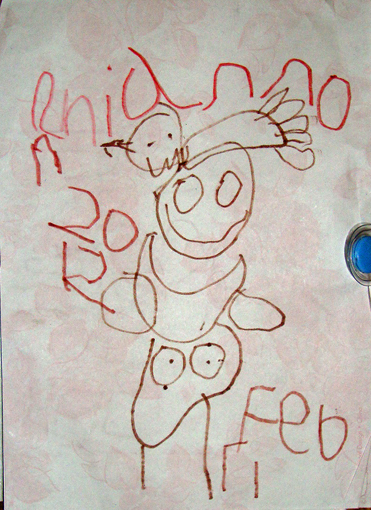 Without prompting, Owain drew the male figure and Rhiannon the female one. I thought that was interesting. The male figure has a bowl on his head and the female figure has a bird. 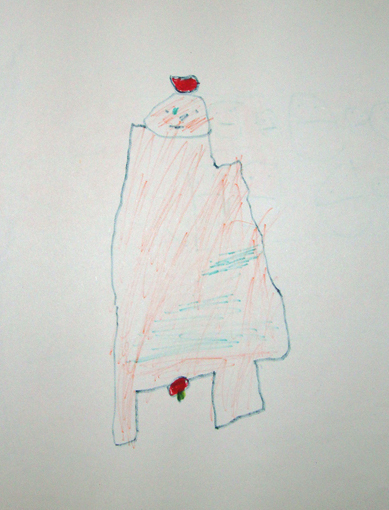 Nathan, their cousin, also 7, drew the male figure as well. His is the drawing below. He also included a lovely little sculpted bird that was on the wall above the figure. It’s great to see the completely different styles between the three of them. 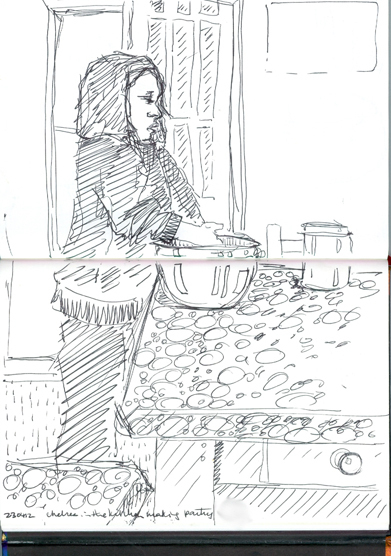 Ink sketches: Owain in the milk bar. I don’t find children easy to draw. They’re like animals and birds, they’re not still unless they’re asleep so sketches have to be very quick and you’re lucky if you get an accurate likeness. Here’s a page of sketches I did of Owain when we took him to the local milkshake bar. He was chuffed to find that he could have a milkshake made with a Curly Wurly. I know it’s not healthy but aunties are allowed to spoil nephews and nieces. 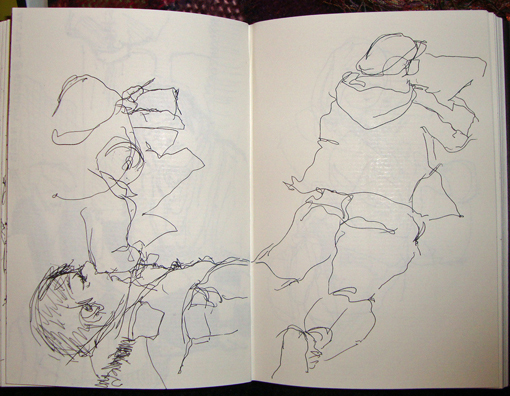 I did some quick scribbles in between slurps of milkshake [of course, I had a fruit smoothie]. The bottom sketch looks reasonably like him. It’s easier to draw older people because features are stronger and more defined and there are more points of reference like wrinkles and saggy bits. A child’s head also has completely different proportions, with the face being ‘scrunched’ up into a smaller part of the head – it stretches as the child grows older. Noses are littler and cuter and eyes look much larger. Bit like aliens really. Faber Castell Pitt pens into a Fabriano sketchbook.